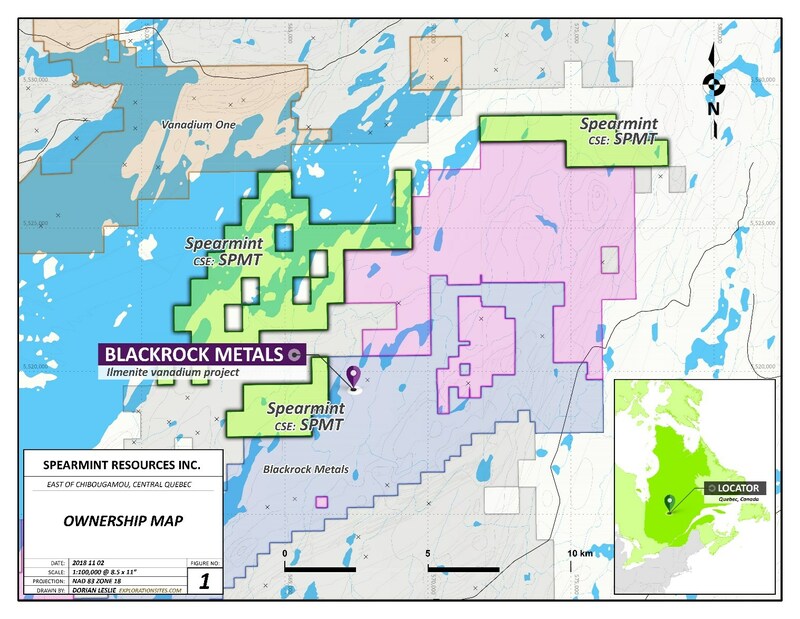 Vancouver, British Columbia--(Newsfile Corp. - December 13, 2018) - Spearmint Resources Inc. (CSE: SPMT) (OTC Pink: SPMTF) (FSE: A2AHL5) (the "Company") is pleased to announce that upon receiving preliminary airborne data, the Company immediately increased its acreage in the Chibougamau Vanadium district to 13,985 contiguous acres. James Nelson, President of Spearmint, stated "We are optimistic to have received such encouraging preliminary data from the airborne surveys and are awaiting final results from the entirety of the property before the end of the year. Having already uncovered at least one potential high priority target to date on our Vanadium prospect, we immediately expanded and consolidated our existing fragmented properties into one large contiguous land package bordering BlackRock Metals. This new acreage strengthens our significant footprint in this world class Vanadium district. As the Vanadium price-per-pound has recently reached all-time highs, breaking over $33USD per pound, we are very excited to have uncovered this sharply defined target this early in the phase one work program on our Chibougamau Vanadium prospect. Immediate follow up work is being planned and management is expecting to have crews on the ground shortly to further investigate this specific anomaly." Spearmint's current projects also include a portfolio of prospects in the Golden Triangle of British Columbia; the 'Golden Triangle Gold Prospects' comprising of six separate claims blocks totalling 9,157 acres bordering GT Gold Corp, the 920 acre 'NEBA West' & 6,803 acre 'NEBA' Gold-Copper Prospects bordering Aben Resources Ltd, the 'Henry' Gold-Copper Prospect consisting of two contiguous claim blocks totalling 1,989 acres in the direct vicinity of Golden Ridge Resources Ltd., and the 21,587 acre 'EL North' Nickel-Copper Prospect is a contiguous land package of six claims in the Eskay Creek Camp bordering Garibaldi Resources Corp. Spearmint's other projects in British Columbia include the 'Gold Mountain Prospects' comprising of three separate claim blocks totalling 1,245 acres bordering Barkerville Gold Mines, Spearmint's 16,662 acre 'WHY WEST' Magnesium project consisting of six claims near Rossland BC, the 'Safari' Copper-Gold Prospect consisting of 9,007 contiguous acres located in the northern Quesnel Trough in North-Central BC directly bordering Serengeti Resources Inc., and the 'Hammernose' Gold Prospect consisting of 5,140 acres directly bordering the strategic alliance between Westhaven Ventures Inc. & Sable Resources Ltd. in the Spences Bridge gold belt located in Southern British Columbia, Canada. These new claims were acquired via Gestim.